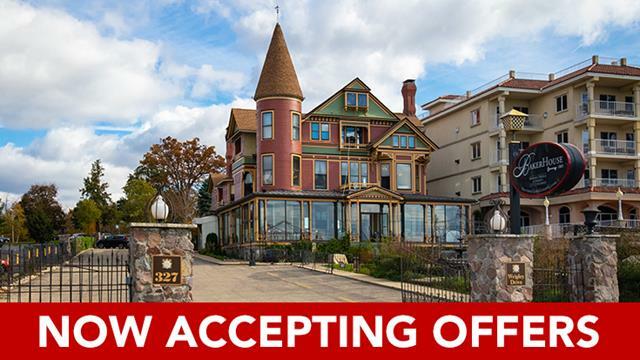 The Baker House features a luxury dining experience in five parlors and a wrap-around porch, five unique luxury guestrooms, a three-bedroom owner's suite, two spa treatment rooms, 114 feet of lake frontage, a commercial pier and a large front lawn with perennial garden used for events. The property's award-winning renovation, design and service cultivates repeat guests through themed food and beverage offerings, butler service and a distinctive luxury experience. The property contains 13,682+/- sf and from 2010-2017, the current owner completed upgrades totaling $1.0 million and converted the property to the Baker House with its distinct guestrooms and dining venues. Parlor 1 - The Ringmaster's Roost is a lounge offering 20 seats and a full liquor license. The lounge is open four days per week and otherwise open when there are overnight hotel guests on the property. The room is rich in décor and a favorite of patrons. It features many original details such as the china breakfront that now displays the liquor behind the bar, an ornate working fireplace with antique tiles and hand-carved wood mantel that has a built-in brandy warmer. There is also a "Butlers Call Button" located in the center of the floor. Parlor 2 - "The Dining Room" seats 20 and has 12-foot-tall pocket doors that enable it to also be used for small private events. There is a floor-to-ceiling carved mantle that surrounds a working fireplace with antique Lowe tile. A large ornate antique rosewood inlaid table is the dramatic focal point of the room. Parlor 3 - "The Library" seats up to 14 and has lake views. There are custom mahogany built-in book shelves, Persian carpet and a working fireplace. Parlor 4 - "The Game Room" seats 16, has lake views through the beautiful bay window, a working fireplace with antique tile, an exquisite Tiffany-style chandelier and an antique roulette table that has been converted to a dining table. palladium mirror surrounding a working fireplace with antique Lowe tile. The Wrap-Around Porch rounds out the indoor dining with an additional 24 seats all with panoramic views of the lake and garden. The porch is enclosed by floor-to-ceiling glass and is climate controlled. There is also an auxiliary bar on the south end that is wonderful for servicing private parties as well as garden patrons. A parcel of land located in the Original Plat of the Village (now City of) Lake Geneva, and being a part of Block 44, Illinois Street (now vacated) and the Reserved Lot as set forth and depicted thereon, in the County of Walworth, State of Wisconsin, and being more particularly described as: Commencing at a point in the West line of Block 34 of the Village of Geneva (now City of Lake Geneva) according to the survey and plat of said Village of record in the Office of the Register of Deeds of Walworth County, 180.39 feet North of the South end of said West line, thence South 67° West in the north line of lands owned or lately owned by the heirs of C.M. Baker deceased, 300 feet to the street line, thence North 31° West in the East line of said street 109 feet to a cut stone monument with lead in the top, in the East line of said street, and being the Southwest corner of lands owned by Lake Geneva Sanitarius, formerly Oakwood Retreat Association, thence North 70 1/4° East in the South line of lands owned by said Lake Geneva Sanitarium to an angle whereat is place a stone monument, thence East in the South line of said land 83.75 feet to a stone monument which stands in the aforesaid West line of said Block 34, thence South in said West line of Block 34, 65.75 feet to the place of commencement, being the lands described in deed from Luella W. Johnston to Lake Geneva Sanitarium dated January 25, 1910 and recorded July 29, 1910 in Volume 127 of Deeds, page 501, Walworth County, Wisconsin. Said land being in the City of Lake Geneva, County Walworth and State of Wisconsin. Lease Agreement Disclosure. Buyer acknowledges and understands that The Pier has current lease agreements. Buyer acknowledges receipt of current lease agreements and agrees to be bound by same. Upon expiration of current lease agreements Buyer accepts responsibility for eviction, lease or rental negotiation, or other remediation, as Buyer finds necessary in order to clarify legal occupancy status. Buyer agrees to hold Seller, Williams & Williams, and its agents harmless from any and all results therein. Buyer acknowledges receipt of current lease agreements. Buyer responsible for obtaining any necessary permits or licenses necessary to continue the operation of the business. Seller intends to continue normal operation until day of Closing. Each high bidder must make a 10% non-refundable deposit per property ($5,000 MINIMUM - whichever is greater) immediately following auction. Cash, cashier's checks, personal checks and business checks (electronically processed) are accepted. If you are a resident / citizen of a country outside of the US, certified funds (bank check, wire transfer, certified checks) are required for the down payment and closing. The balance of the purchase price, all closing costs, and the Technology Fee are due at closing. Buyer is responsible for all escrow and closing fees typically ranging from $750-$3000. It is the Buyer’s responsibility to contact a local title agency or real estate attorney for a property specific estimate prior to placing a bid. All auctions are subject to court or seller approval. Most sales are approved within seven (7) business days. Buyers are not allowed possession until Closing and filing of the deed, at which time the property should be re-keyed. If for any reason the court or Seller approval is not granted, the Down Payment shall be returned in its entirety to the high bidder. "Showing" requests from Buyers after the auction may not be able to be accommodated.